Is it really possible to view 3D terrain in a browser? 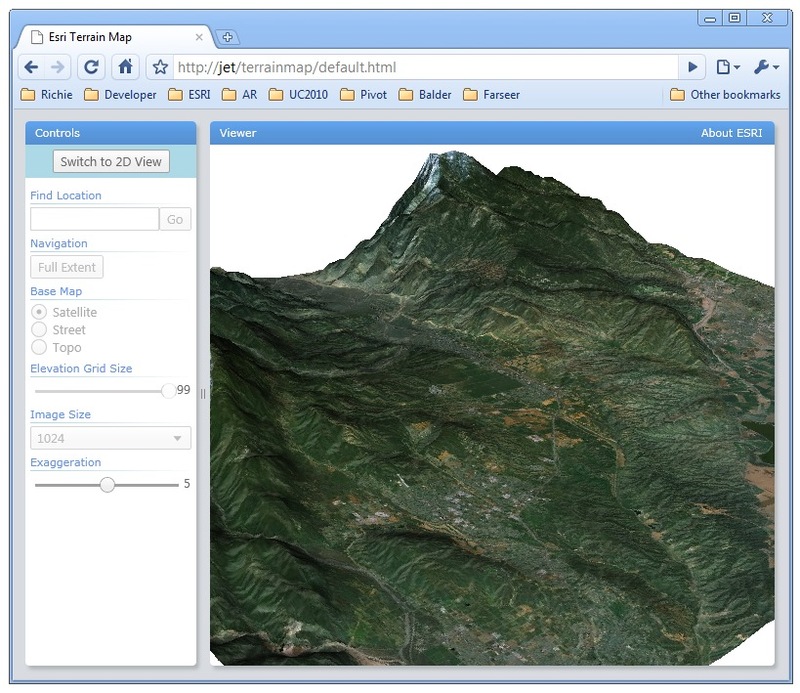 Yes, with the aid of Silverlight, Esri’s Silverlight SDK and Balder, an open source 3D graphics engine. The sample web application pictured above is running live here and the source code can be downloaded from here. After the web application has loaded, pan and zoom to an area of interest and then click the “Switch to 3D View” button. The application will pause slightly as it downloads a new map image and the underlying elevation data. After the map has transformed to a 3D display you can use the left mouse button to tilt and/or pivot the extruded terrain. Click “Switch to 2D” to return to the original 2D map display. Try repeating the steps above for your favorite places around the world (land or sea)! A quick method to zoom to a specific extent is to hold the shift key down while dragging with the left mouse button. This will render a red rectangle on the screen. When the left mouse button is released the map will zoom to the extent defined by the rectangle. To assist, here is a short video demonstration on YouTube. The imagery, street and topography base maps are sourced directly from Esri’s ArcGIS Online portal for geospatial services, data, applications and communities. Elevation data is sourced from SRTM, GTOPO30 and GEBCO bathymetry via a new service published yesterday. The service was developed as a custom Server Object Extension for ArcGIS Server. For more information on this service and how it was implemented please visit this blog post.